Welcome to our second, somewhat belated newsletter for the year. The good news is that the reason this newsletter is overdue is because Ascent has been so busy in the past few months, servicing not only all our existing clients, but also the new ones we have recently brought on board, that we have barely had time to breathe. This is, of course, a very exciting time for us, and we hope that we can share some of this excitement with you as we inform you of some interesting new developments in the Database Management space. and to what degree they are outsourcing their Database Management requirements. As the official sponsor, we look forward to publishing the results of this first annual survey, and of making the unique insights into this space it will provide available to you. Of course, if you haven’t yet participated in the survey, the question is what are you waiting for? After all, you also stand a chance to win the new iPad (3G WiFi), so click here to participate – and do it now, as there are only a few days remaining before the survey closes. We are sure you are all avid readers of the Ascent-sponsored Data Management Portal on ITWeb. As such, we are excited to announce the upcoming launch of another Ascent and ITWeb collaboration, the monthly Data Management Newsletter. This will enable you to read up on all the latest news, products, services and happenings in this distinctive market space. Keep your eyes open for this unique development – it’s coming soon. Ascent understands our clients’ desire for continuity in skills and expertise; to this end, we are focusing on developing the next generation of highly skilled individuals, while at the same time making a contribution to youth employment. We have just launched our eighth annual internship programme, which will once again adopt a Microsoft focus and we expect it to replicate our previous successes in this regard. Ascent is very proud to note that a number of our former interns are working within our client base, thereby contributing to the economy while at the same time adding even more value to our clients. In the last newsletter, we informed you of our ongoing strategy to find the right products that will offer you strategic value in the Database Management space, and promised you we would be seeking additional ones to do just that. We have now brought on board Imperva, which – alongside our McAfee and IBM InfoSphere Guardium offerings – ensures that we can now deliver all three of the leading products in the Database Security and Compliance space. This cements our reputation as the top heterogeneous player in the Database Management arena. We have begun noticing a new trend amongst large organisations, whereby these enterprises are no longer including Database Management as part of their overall outsourcing deals with the large full IT infrastructure outsourcers. Instead, they are turning to specialists like us to perform this niche task. These clients are realising that they need a specialist provider for what is essentially a specialist undertaking. Thus they are beginning to segment their outsourcing requirements in order to take advantage of Ascent’s skills, expertise and service level agreements in this arena. We are, of course, comfortable working with clients of this nature, since our business model, by its very nature, works equally well for small, medium and large clients. This means it is a perfect fit for these large corporations, just as it is for every one of our small, medium and large clients. 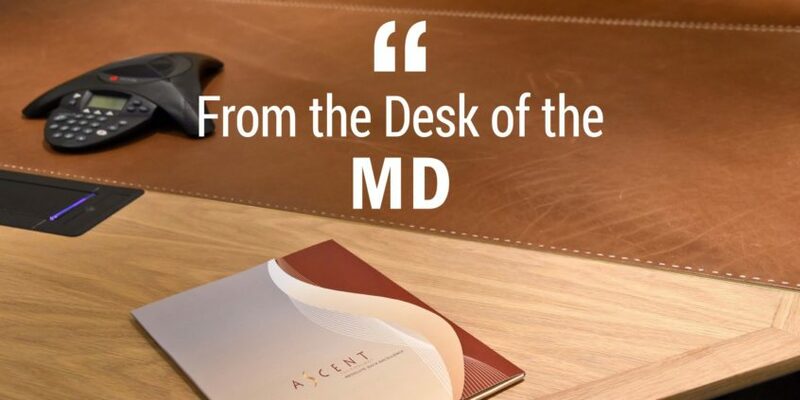 To all our new clients, both large and small, we want to welcome you to the Ascent Community and we look forward to enjoying a long and fruitful relationship with you. Equally, we are eager to continue growing our relationships with our existing clients, as we all move ahead into what we at Ascent expect to be a very bright future.